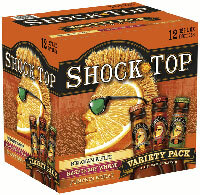 ST. LOUIS, MO — Just in time for fall, Shock Top Belgian White will be adding to the family with the launch of Shock Top Pumpkin Wheat, the brand’s first seasonal offering, as well as a Shock Top Variety Pack, the brand’s first sampler pack that will also highlight Shock Top Raspberry Wheat, which launched earlier in the year. Available Aug. 29 through January 2012, Shock Top Pumpkin Wheat is a traditional Belgian-style wheat ale brewed with ripe pumpkins and a variety of autumnal spices, including nutmeg, cinnamon and cloves, for a refreshingly smooth beer with a deep amber color that captures the flavors of fall. With a 5.2% ABV, Pumpkin Wheat will be sold nationwide in six-packs of 12-ounce bottles and on draught. Shortly after the release of Pumpkin Wheat, look for Shock Top’s first variety pack, which features four bottles each of Shock Top Belgian White, Shock Top Raspberry Wheat and Shock Top Pumpkin Wheat. Sold nationwide, the 12-pack samplers will be available beginning Sept. 19 through the end of the year. Earlier this year, Shock Top Belgian White rolled out its first extension with Shock Top Raspberry Wheat, available nationwide on draught and in six-packs of 12-ounce bottles. Shock Top Belgian White also introduced 12-ounce aluminum cans and 22-ounce bottles to its packaging line-up, to provide even more options for Shock Top fans to enjoy their favorite Belgian-style wheat ale, whatever the occasion. Shock Top Belgian White is an award-winning Belgian-style unfiltered wheat ale, with a naturally cloudy and light golden color. Shock Top is brewed with orange, lemon and lime peels and coriander, giving it a refreshing, smooth taste and a citrusy aroma.